We make our first stop in Point Reyes Station, only a short drive north of San Francisco, inspired by the simplicity and atmosphere. Our lack of need to rush northward seems to be reenforced. We take the time to stop and be inspired and enjoy. We make time for Elias and Frêney to stretch their legs and get our their wiggles in a small playground behind the old garage that has been converted into a feed store/yoga studio/café. The juxtaposition of tibetan prayer flags hanging from the rafters, with bags of feed and bales of hay make us ponder the life of the locals. We are already made aware that we are fortunate to be traveling now, before the tourists arrive on summer vacation, changing the ambiance and pace. Now, in May, we are able to relax and slow down. As we drive on, our eyes continue to be open not wanting to miss what lies around us, the aroma of blossoming eucalyptus, the sounds of the oceans as it thunders into the rocky cliffs, or watching an osprey sail in the winds coming off the ocean. As we drive around another corner we see an old weathered gray church catches our eye, and then a grave yard with old wooden Russian orthodox crosses. Suddenly we find ourselves at the old russian settlement of Fort Ross, an almost neglected part of California's history. While only a few buildings around the fort remain, the worn wooden walls and roofs blend into the surrounding hills and out into the Pacific. They tell a story of a lonely Russian outpost built in the 1800s to support Russian traders and trappers further north in Alaska. This single settlement was all that was ever existed and all that remains of the early Russian settlers. 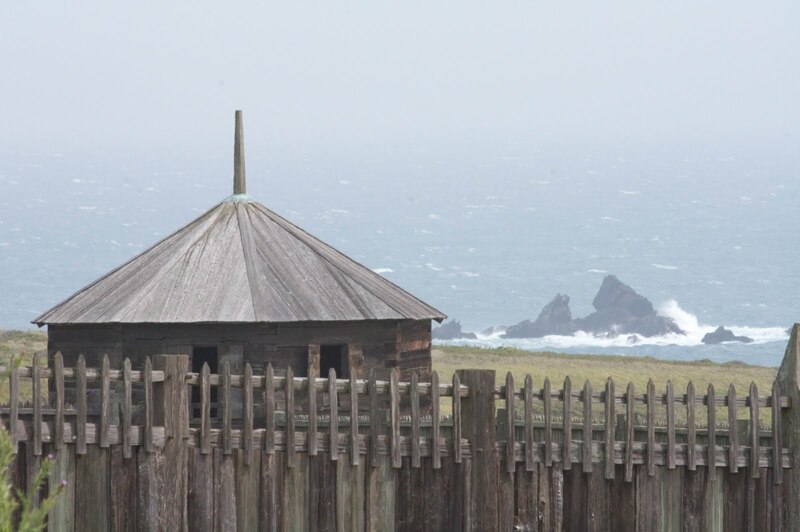 While unplanned, this stop at Fort Ross is part of our plan to absorb the history of place as we journey northward. Whether it be the people or the rocks, and whether their history is just a few or, hundreds, thousands or millions of years old, they are all part what makes this coastline unique. As the afternoon sun begins to wane we arrive at Ocean Cove, nothing more than a general store and a campground, perched quaintly on the cliffs above the crashing surf. We look out onto the ocean and feel the contrast between warm sun and ocean breeze in our faces and decide that this is far enough, for today. It could be that regardless of where we turn we will be inspired, as all is new and ever changing. Our journey north is only just beginning, but we are already content, inspired by the never ending beauty.